Ohio train rides are prolific and many! If museums are more your thing several can also be found across the state. 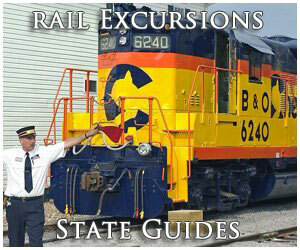 There are currently nearly a dozen tourist railroad attractions within the Buckeye State. These include the Cedar Point & Lake Erie Railroad (a component of the Cedar Point amusement park); Hocking Valley Scenic Railway (the only place to ride behind a historic, standard-gauge steam locomotive! 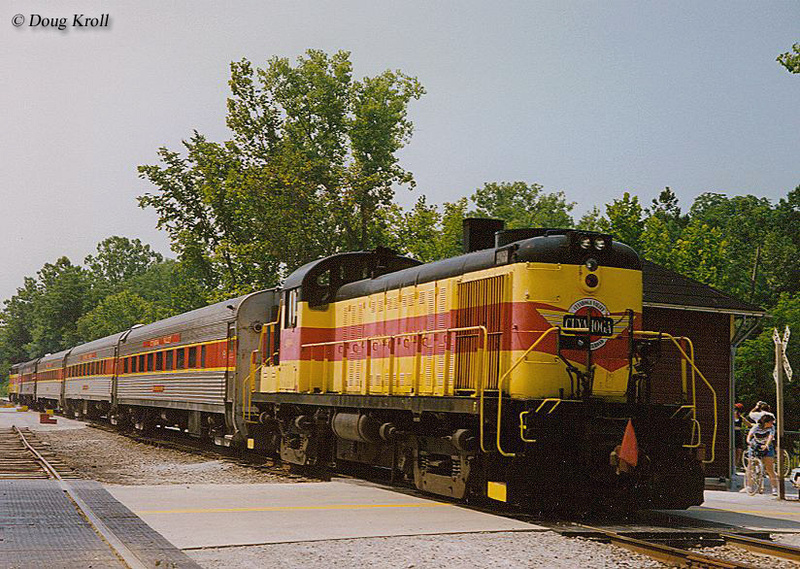 ); Lebanon Mason Monroe Railroad; Lorain & West Virginia Railway; Toledo, Lake Erie & Western Railway & Museum; and the very popular Cuyahoga Valley Scenic Railroad. Such a far-reaching selection can be attributed to Ohio's location and industrial might in bygone days. With a peak mileage of 9,002 in 1920 (from the book, "The Routledge Historical Atlas Of The American Railroads" by author John F. Stover), only Illinois and Pennsylvania contained more trackage among Eastern/Midwestern states. Within its borders could be found four major trunk lines (Erie, Baltimore & Ohio, Pennsylvania, and New York Central), other important corridors linking important centers of commerce (such as Cleveland, Youngstown, Toledo, Akron, Columbus, and Cincinnati), and a multitude of branch lines serving agricultural and coal interests. The information presented here highlights only the state's excursions and museums. As railroads transitioned from entities serving local interests to a unified, national network, Ohio was poised to flourish. Chicago blossomed into an epicenter where railroads from the north, south, east, and west all converged and interchanged. With most business flowing east-to-west, Ohio's mileage grew prodigiously during the 19th century. According to an in-depth analysis Trains Magazine published in its January, 2007 issue entitled, "Great Railroading: State-By-State," its first railroad was the Mad River & Lake Erie (MR&LE) chartered in 1835 to connect the Lake Erie port of Sandusky with Springfield. It is also recognized as the first chartered west of the Allegheny Mountains. Construction began from Sandusky on September 17, 1835; on hand for this event was General William Henry Harrison (who went on to become the 9th president of the United States in 1841) and Ohio governor Joseph Vance. Thanks to the area's relatively flat topography, work proceeded quickly; in 1839 tracklayers arrived at Republic and then Tiffin by 1842. Its initial southern terminus of Springfield was reached in June, 1849, a distance of 134.5 miles at a cost $1.754 million. In the following years the MR&LE continued to grow, extending to Dayton and Findlay by the early 1850's. In 1858, however, the road abandoned its original alignment between Sandusky and Tiffin in favor of a better route built by the Sandusky City & Indiana Railroad via Clyde, Ohio. During the next several decades the railroad changed hands and names multiple times. The 19th century's mega-merger movement witnessed the East's four principle trunk lines coming together, a time which saw the MR&LE folded into the much larger Cleveland, Cincinnati, Chicago & St. Louis Railway on November 1, 1890. Better known as the "Big Four," the CCC&StL has its own long, and fascinating, history. It was created on June 30, 1889 when the New York Central & Hudson River merged three predecessors into one. Into the 20th century, Ohio not only contained key through routes but was also an industrial powerhouse; Youngstown produced steel, Akron manufactured rubber, and Toledo was the so-called "Glass Capital Of The World." Places like Cincinnati, Columbus, and even Canton were also major manufacturing centers. Finally, the ports of Ashtabula, Lorain, Cleveland, and Sandusky handled millions of tons of iron ore from Minnesota that went into the production of steel while southern Ohio contained many coal mines. 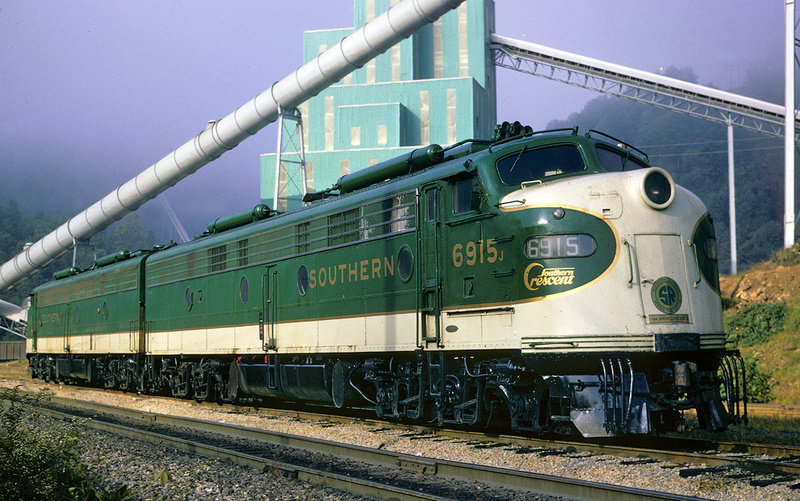 The state's economy was so strong that many fondly remembered railroads served it in some fashion: names like the Baltimore & Ohio; Pennsylvania; New York Central; Erie; Norfolk & Western; Chesapeake & Ohio; Arkon, Canton & Youngstown; and Wheeling & Lake Erie; Wabash; and Nickel Plate Road (New York, Chicago & St. Louis). Alas, following World War II, the state's heavy industry began a long decline as these businesses closed or were outsourced overseas. 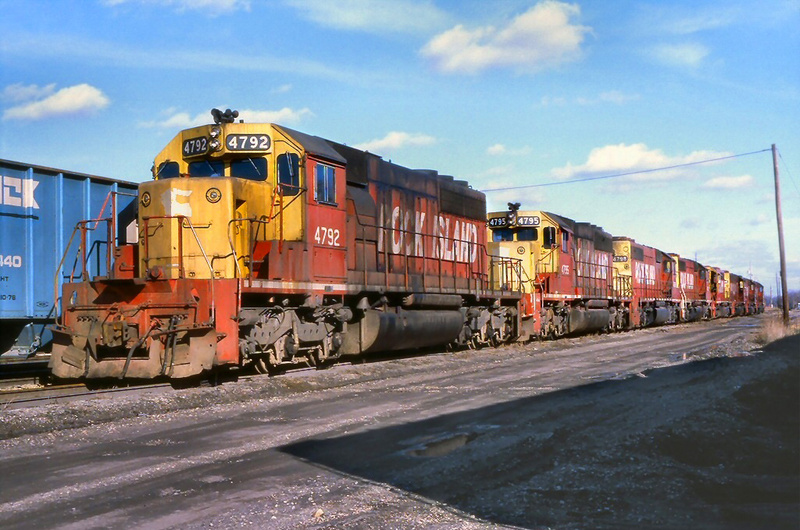 In 1965, its total mileage had dropped to 8,131 and following railroading's dark decade of the 1970's, in which many carriers went bankrupt, mass abandonments were carried out. By 1995 Ohio contained just 5,123 miles, a number which has more or less remained steady since that time. Today, the venerable names of yore are all gone, wiped away for the reasons mentioned above. The state is currently served by Class I's CSX Transportation and Norfolk Southern while numerous short lines make up the rest. 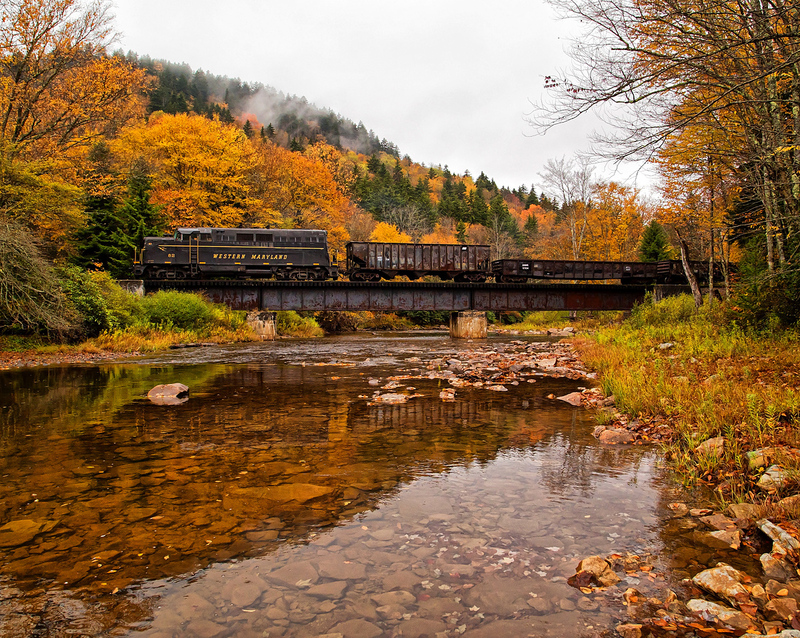 Its tourist railroad industry aims to preserve its rich history; most offer rides lasting more than an hour, allowing guests to view rolling farm country and breathtaking national parks. 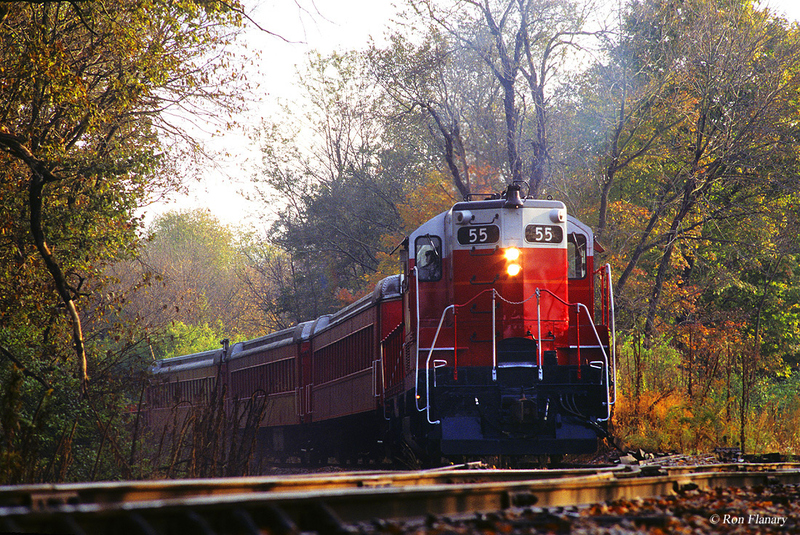 Thanks to its location within the Cuyahoga Valley National Park, and proximity to the Cleveland metro region, the Cuyahoga Valley Scenic Railroad is the most popular. It witnesses tens of thousands of visitors annually, offering all sorts of special trips throughout the year. 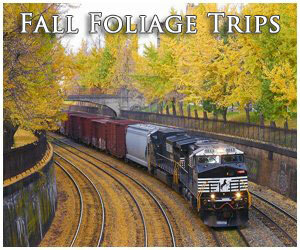 If you are interested in Ohio train rides that pertain to specific events, such as "The Polar Express," Halloween, Thomas the Tank Engine excursions, or fall foliage events please visit the main tourist trains section of this website. One of Ohio's most unique and fascinating railroad attractions is this facility located in Sugarcreek, which has only been in operation since 2011! It was built by the late Jerry Jacobson, a professional railroader who also loved trains. It is a fully functional and operational roundhouse that acts as a locomotive/car repair operation. However, following his death the organization now offers public tours. 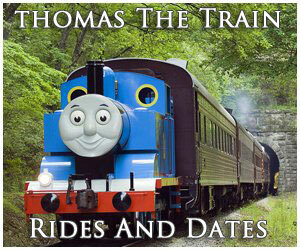 There, you can see nearly two-dozen restored or preserved steam locomotives! Anyone with an interest in trains will love this place. To learn more please visit their website. 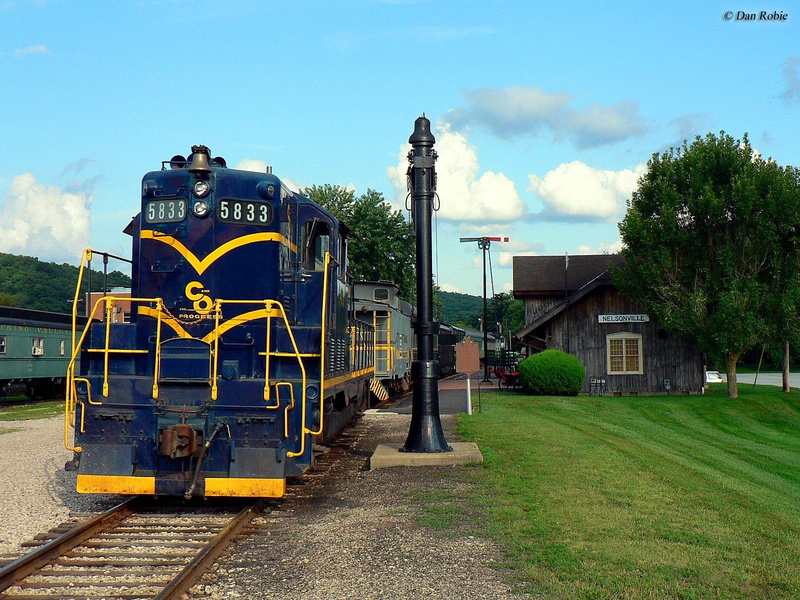 Located in the town of Bradford this museum's focus is local railroad history. Their focal point is an original, preserved Pennsylvania Railroad interlocking tower (BF), which is available for tours on select dates. Sadly, the PRR's once prolific presence in this small town is no more; both its main line to Chicago and connector to the busy "Panhandle Route" are both abandoned today. The Carillon Park Rail & Steam Society, based in Dayton, has a small selection of rolling stock on hand and also provides scale train rides on select days throughout the year. 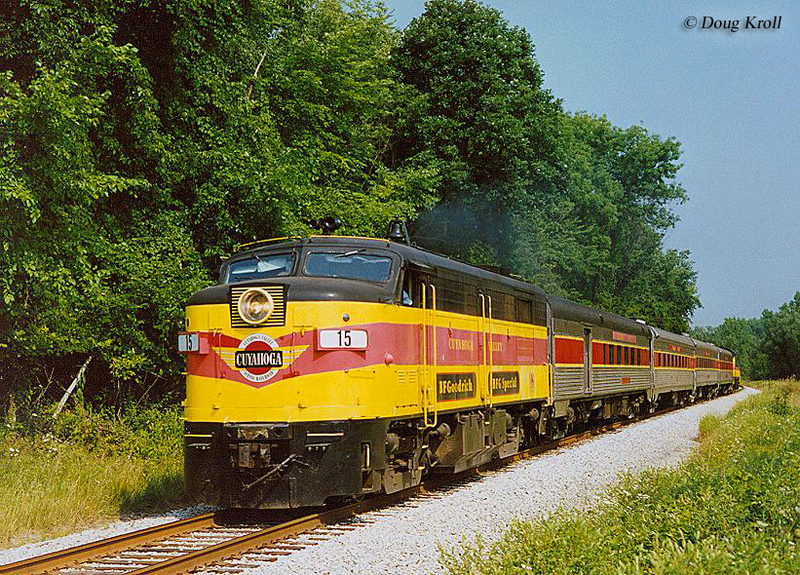 The Cedar Point & Lake Erie Railroad is an excursion train built for the popular theme park in Cedar Point in the 1960s. Today, it operates several steam locomotives (all historic and well worth the visit for any rail aficionado!) on a short stretch of narrow-gauge (36-inch) track that traverses the park's grounds. This organization began in 1964 as a non-profit to preserve local railroad history. They are housed within the Lake Shore & Michigan Southern (New York Central) brick depot built in 1900. They have seasonal hours from Memorial Day through Labor Day. The most popular of all Ohio train rides is the Cuyahoga Valley Scenic Railroad thanks to its location to Cleveland and the Cuyahoga Valley National Park. It uses tracks once owned by the Baltimore & Ohio and while the railroad does not maintain steam locomotives it does field a fleet of historic streamlined diesels built by the Montreal Locomotive Works (a division of American Locomotive). Throughout the year they host special events (such as the popular Day Out With Thomas and holiday festivities such as during Halloween, Thanksgiving, and Christmas). The Dennison Railroad Depot Museum, based in Dennison, is open most of the year. It is housed inside the restored 1873 Pennsylvania Railroad depot and offers a wide range of static displays and rolling stock. In addition, be sure to dine at their restaurant. 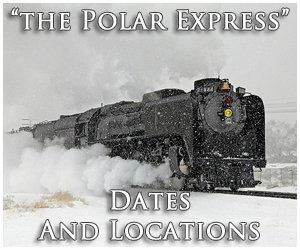 The organization also provides official Polar Express rides in December. This tourist attraction is based in West Chester and claims to have the largest indoor display of G-scale model trains anywhere in the world. To learn more please visit their website. The Hocking Valley Scenic Railway is located in Nelsonville, Ohio and operates a former Chesapeake & Ohio branch to Athens. The HVSR now offers the only place in Ohio were one can enjoy train rides behind a historic, standard-gauge steam locomotive. This 0-6-0 was built by the Baldwin Locomotive Works in 1920 and spent much of its career for Ohio Power. This attraction is located in Jefferson. Its stated purpose is to highlight what life was like in Ohio and the Midwest during the 19th century. It is a living history museum with fourteen historic buildings on hand. One is a preserved 1872 depot originally built by the Cleveland, Painesville & Ashtabula Railroad (later acquired by the Lake Shore & Michigan Southern, a future component of the New York Central). To learn more please visit their website. The Lebanon Mason Monroe Railroad based in Lebanon, Ohio operates on trackage once owned by the Pennsylvania Railroad. Trains board from Lebanon for about a 1.5-hour trip while the railroad also offers numerous seasonal and special trains throughout the year. The Lorain & West Virginia Railway based in Elyria, Ohio operates on trackage originally built by the railroad of the same name. Currently they have about 5 miles of track open for service but plan to restore the entire line between Wellington and Elyria operating both freight and passenger trains. This museum is based in Bellevue and takes part of its name from the railroad which originally served the town, the Mad River & Lake Erie. This road would abandon its original alignment through Bellevue in early 1858 for a better grade running via nearby Clyde. Bellevue would later become an important point along the New York, Chicago & St. Louis (Nickel Plate Road), which became the location of a major yard and shop facilities. Today, the museum houses several artifacts and displays. As the name suggests this is the town of Marion's preserved union station, which is surrounded by active main lines. The facility, which includes a preserved Erie Lackawanna caboose, has select times available for tours. To learn more about visiting the location please call them at 740-383-3768. This organization is located in Seville and primarily focuses on a local and national interurban history. It owns 2 miles of the former Cleveland, Southwestern & Columbus Railway's right-of-way, a traction system that once served its home area. They have a large collection of preserved streetcar/interurban equipment on hand and a small carbarn to house the cars. The museum is open from late May through October. The NORP is based in Findlay offering quarter-scale train rides to the public along with a small museum, gift shop, and layouts to view. The Ohio Railway Museum, based in Worthington, offers visitors the chance to peruse historic rolling stock while also offering short excursion train rides. The organization operates these trips on Sunday afternoons only. This non-profit group is located in Orrville and generally aims to preserve Ohio's rich history with railroads. They have a few pieces of rolling stock on hand including GP7 #471 which hosts excursions. To learn more please visit their website. The Toledo, Lake Erie & Western Railway & Museum is based in Waterville, Ohio. The organization hosts a 15-mile round trip on trackage once owned by the "Nickel Plate Road." Their train is known as the Bluebird Passenger Train and normally operates between May and November. The Warther Museum, located in Dover, Ohio, features very likely the most detailed and well-constructed train carvings you can find throughout the world. Not only are the carvings superbly well crafted but they are also built of rare natural materials such as ivory and ebony. Perhaps most amazing is these models are mechanically operable and just static display pieces. The collection is a must-see; you will certainly not be disappointed by a visit to Dover, Ohio. The Warther Museum is entirely self-funded and family operated, The organization currently houses all but a few of Mr. Warther's original pieces; the others' locations are all accounted for and perhaps one day will return to the museum. Ernest Warther was a self-taught man who had an education no better than elementary level. However, his love of trains and interest in carving allowed him to create works of art that are, astonishingly, considered priceless by the Smithsonian Institution. Never one who particularly loved diesel locomotives or streamlined steamers, Mooney typically stuck to carving "traditional" steam locomotives where all of the parts and pistons could easily be seen (he did carve one diesel and one streamlined steam locomotive). "Start right where you are and act as if no one is trying to hinder you." "Don't put off until tomorrow what you can do today." "There is more wasted energy spent getting angry then there is in fixing what broke." "Everything has its own rhythm or tempo that is in step with nature and if you can find the tempo of the task at hand, the work becomes effortless." What eventually did become a successful business for was the sale of his very own brand of cutlery that can still purchase today in the museum's gift shop. Mooney never used manufactured knives to do carvings, stating they were simply too clumsy and awkward. Instead, he developed his own style of carving knife, although he never manufactured it for sale. Generally, these one-of-a-kind carving knives feature very short blades, most just a thumb-size in length, and can be easily interchanged to save time and energy. The world of Ernest and Freida Warther has grown over the years. Today, 2nd, 3rd, and 4th generation Warther's operate the Warther Museum, knife making shop, button collection, arrowheads, gardens and the gift shop. While Ernest "Mooney" Warther never made millions from his priceless carvings he lived a very enjoyable life spending plenty of time with friends and family when not in the workshop. While the great carver passed away many years ago, his legacy and carvings live on at his home and property in Dover.